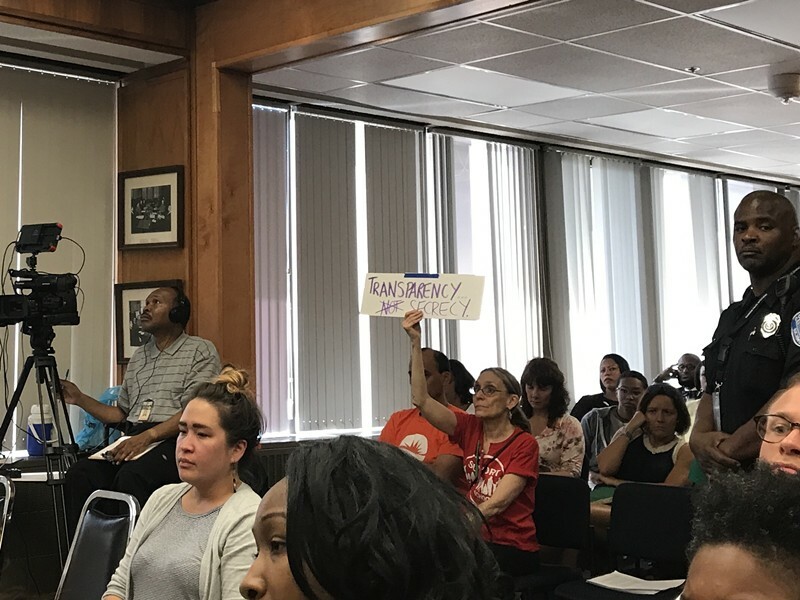 Dispatches from City Hall on May 1 | News and Features | Style Weekly - Richmond, VA local news, arts, and events. Jackie Kruszewski Councilman Parker Agelasto takes a break from a 15-hour budget work session to talk to May Day protesters. A large police presence shut down City Hall during the peaceful rally. City Hall’s metal exoskeleton marks ground zero for Richmond democracy on Monday — the scene of deliberation, disruption and compromise in council chambers, the School Board floor and the Ninth Street entrance. Starting at 11 a.m., Richmond City Council works on a letter to Mayor Levar Stoney to tell him how they’d like to see the schools’ $8.3 million balance spent. It’s rushed off to his office and everyone is pleased. People take a leisurely lunch, unaware of the imminent water disaster above their heads. Once they’re back at City Hall, the Public Works Department informs them that hundreds of gallons of water are in danger of breaking loose from the water-cooling towers. The department need $2 million in capital funds to repair and replace the towers. Parker Agelasto is suspicious of this dire, immediate request. “This is giving me lack of confidence in the recommendation,” he says. Council President Chris Hilbert asks for 30 minutes. “According to this letter, we may not have 30 minutes,” says Kim Gray. Council decides to give $1.3 million. A letter circulates: The mayor has declined to let council use the $13 million in unassigned balance from the 2016 fiscal year. It would hurt the city's bond rating to spend it, Stoney says. Council continues to slog through amendments to the capital budget. Hours pass. Monroe Park renovations are up. Agelasto is annoyed that money is being transferred from project to project behind the scenes without council’s knowledge or consent. The city wants more time to answer questions. “I’m not coming back to another meeting,” Trammell says. The East End transformation project study engenders a long conversation — enough time for the city attorney to come back with information about the Monroe Park contract. Up the elevator spine of City Hall, a twitchy crowd fills the 17th floor School Board room around 5 p.m. It’s the first meeting since the board announced the impending departure of superintendent Dana Bedden. “Transparency, not secrecy,” reads one audience member’s sign. “What is the School Board going to do to earn back the people’s trust?” Chris Lombardi says. Not long into public comment period, a staffer whispers something in the School Board Chairwoman Dawn Page’s ear — to the annoyance of the woman at the dais. Soon after, a TV news crew member — hot off his cell phone — comes up to grab his microphone from the dais. Police chief Alfred Durham has hurried out of City Council chambers, it is reported. Outside, the wind whips street detritus into City Hall’s Ninth Street vestibule. A few people rush to their cars and the NBC-12 crew loads up its van. There’s been a shooting at the Norrell Annex, a school property in Barton Heights, and a worker is injured. Now a resolution must be voted on. Murmurs ripple through the crowd as Page reads the agreed upon severance: $294,571. Only two members speak to the decision. Scott Barlow is the only member to admit dissent about Bedden’s departure. “I’m worried that we haven’t been providing our school district all the tools and time we need to affect positive change,” he says. The vote: Barlow is the only no. After a dramatic pause, Linda Owen abstains. The rest vote yes. One audience member puts in an ear bud to listen to CBS-6’s live video of Bedden and Durham’s news conference about the shooting. A packed school board meeting Monday night was the first since superintendent Dana Bedden's departure was announced. Now on to Bedden’s replacement. The board isn’t ready to name an interim superintendent, but there is a discussion about the timeline for hiring a search company and having a new person in place. State law requires the job be filled by the end of the year: 180 days from Bedden’s June 30 departure. A request for proposals from search firms will likely take 90 days, Charles Ward says. The last search group cost $56,000, Young says. Meetings in May are set to discuss the superintendent's hiring and job description. The journalists get restless again around 7:30, when reports swirl that City Hall is on lockdown. Downstairs, a noisy, peaceful crowd of May Day marchers has attracted a large contingent of police officers. Ninth and Marshall streets are closed, and officers bar reporters from getting too close to the doors. Storm clouds threaten the happy chanting and drumming of the rally. Flags whip in the wind. As police have barred the public from entering City Hall, council suspends its meeting. Agelasto, Trammell and Andreas Addison have come to watch. Parker soon finds himself outside, holding a bullhorn. 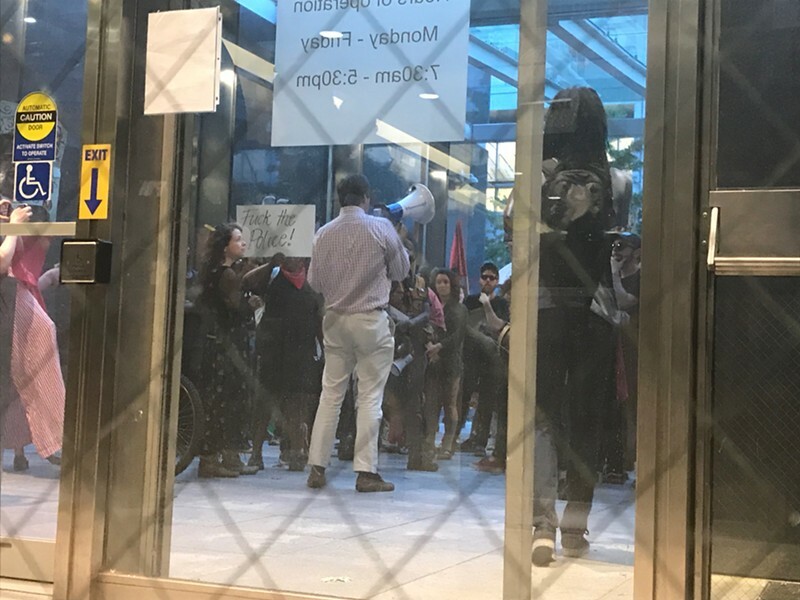 He asks the protesters what they want and a list is quickly scrawled on loose leaf paper: Clean water, no pipeline, transportation for everyone, $15 per hour wages and federal immigration officials out of Richmond are among them. Back in council chambers, Agelasto makes copies and hands the list out to his colleagues. Council resumes the slog through the capital budget. Junk food wrappers litter the members’ dais. Gray presents her changes to the capital budget. She’s reduced funding to one project in her district to fund lighting projects in the Fan and Carver. Agelasto points out a discrepancy in the budget, and a group of finance staffers scramble to figure it out. “This is the sausage-making of government, my friends,” Hilbert says. “This is so sloppy,” Agelasto whispers. “There has to be a better way,” Mike Jones says. The latest of many discussions about this process ensues. Some council members are annoyed at amendments that propose cuts in their districts. There’s frustration about communication between council and city staff. It’s 9:45 p.m. and tepid applause erupts after Hilbert announces they have completed work on the capital budget. They return to the dusty general fund amendments. Old rifts re-emerge: an attempt to cut the bus subsidy, changes to the bulk, and brush and leaves collection. Tensions bubble up and people get punchy, despite a midnight pizza reprieve. “I don’t think that’s how democracy works,” Gray says at some point. The mayor is up, he says on Twitter. Hilbert almost skips into chambers holding an envelope: Council has another $3.2 million in certified funds to spend. A brief spending spree is periodically waylaid by interrogations of bleary-eyed city staff. The meeting will go until 5 a.m., and another will be scheduled for Wednesday, reports The Richmond Times-Dispatch. The city has agreed to find the remaining $1.16 million in cuts. There is, however, a lot of leftover pizza.